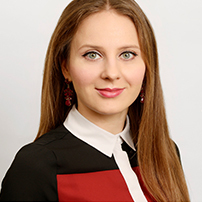 Sasha Saenko is a technology consultant at PwC, the global professional services firm. At PwC, Sasha advises global clients on digital strategy and on how companies can embrace digital trends such as Social Media, Internet of Things and Artificial Intelligence to stay competitive. Sasha is also an active member of PwC Gender Balance Network, which aims to create a level playing field for women at work and a more inclusive workplace for everyone. Outside of work, Sasha is an inspiring mentor to two young female university students and enjoys empowering women to aim higher. In her free time, Sasha is a regular guest at the various charity events, Chelsea football games and art exhibition openings.